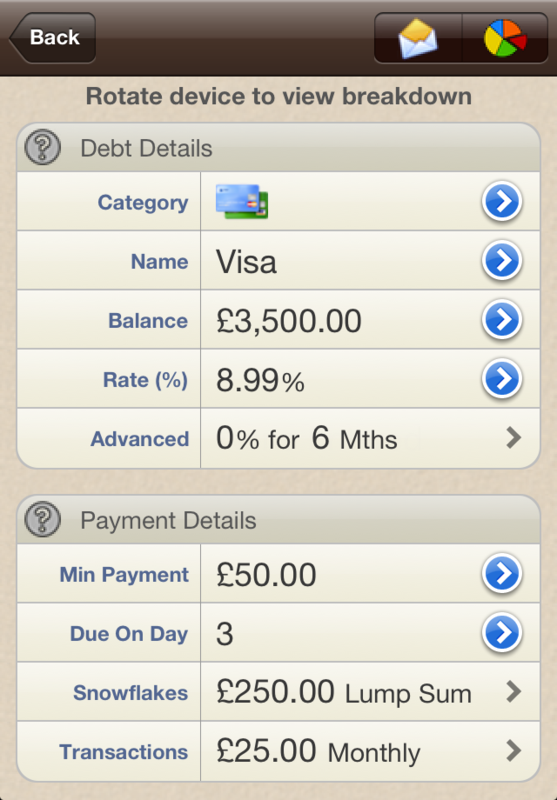 Debt Manager iPhone and iPad App has one aim: to help you get out of debt fast! Q: Want to know the best way to pay off multiple debts? 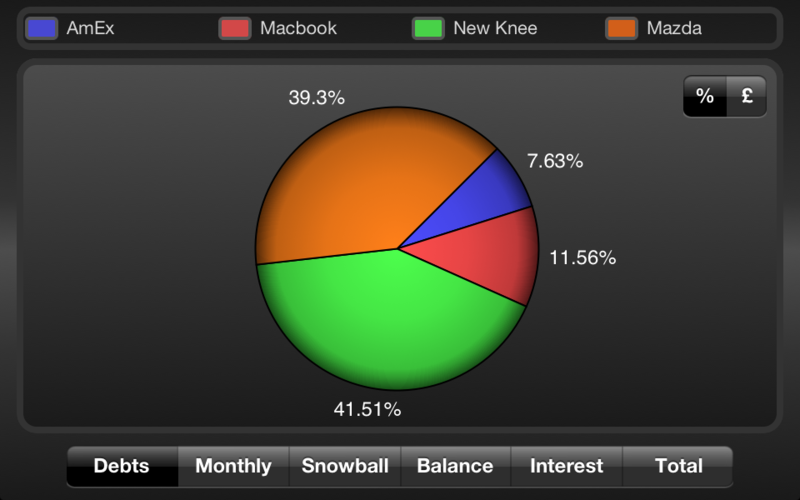 A: This app will quickly and quickly show you how, by applying the Debt Snowball method. Q: Want to know what your monthly payments will be? 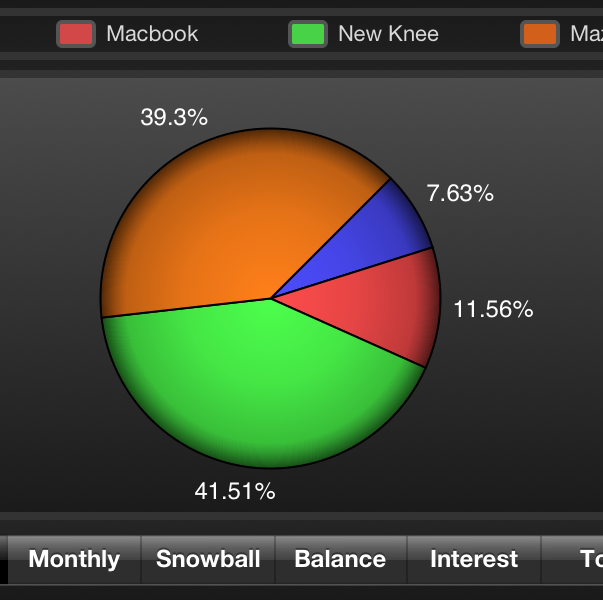 A: You can view the monthly breakdowns in a table or visualise them in a simple, easy to understand chart. Q: Want to try out What-if scenarios? A: You can trial different rates and payments for each debt and instantly see the results. Q: Want to monitor your progress? 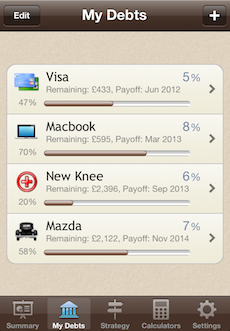 A: The Summary screen shows you exactly how you are doing and how much money and time you are saving. 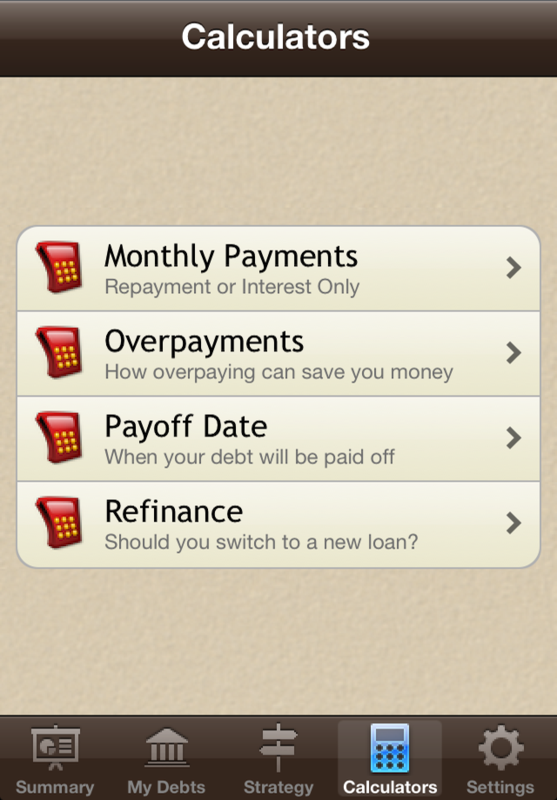 To get started with this app you need to enter the details of each debt. 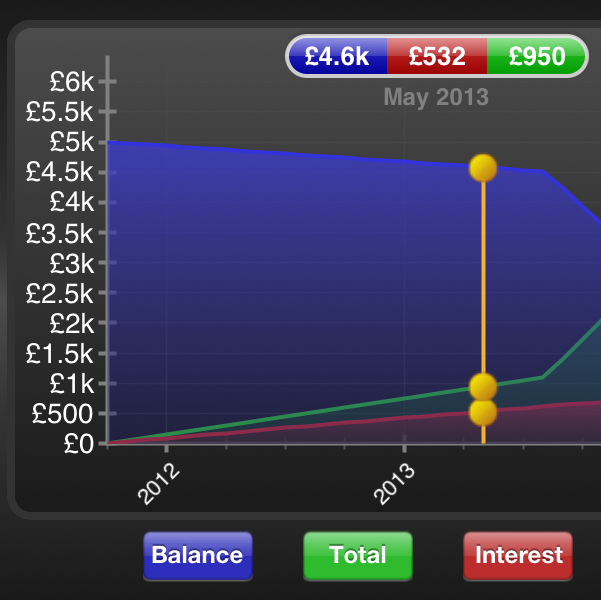 Once entered, the debt is automatically saved and you can view an analysis. Simply flip the iPhone on to its side and you are presented with a breakdown of the monthly payments. 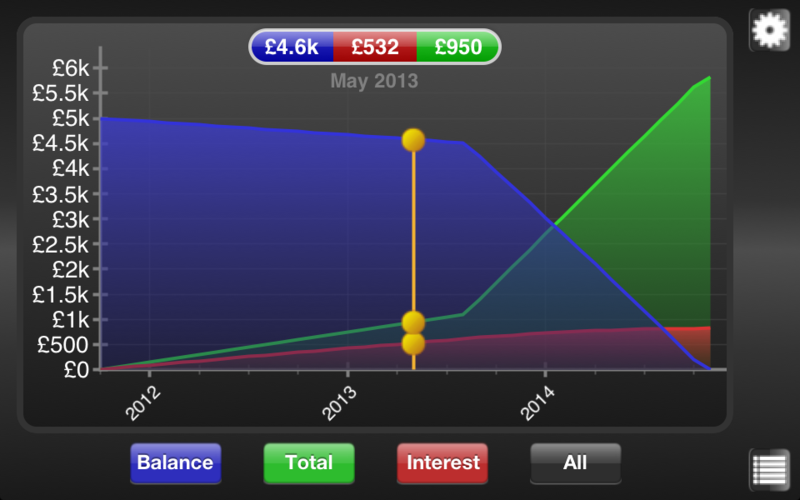 Press the chart icon to 'visualise'	the payments throughout the term of the debt. Once you have entered your debt details, then you need to select a payoff 'Strategy'. 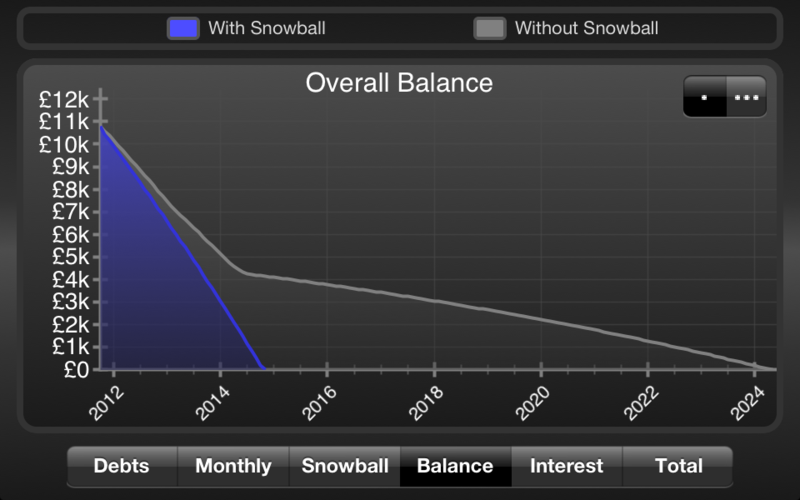 The Debt Snowball method requires you to choose an order in which to pay off your debts. Once the first debt is paid off then the payment for that debt is added on to the payment for the next debt, and so on. For maximum motivation it is recommended to order your debts by 'Lowest Balance First', but for fastest and cheapest payoff you may want to use 'Highest Interest First'. Now you have entered all the necessary data, you can start to analyse your total debt. The 'Summary' tab shows your current payoff progress and how much time and money you are saving. 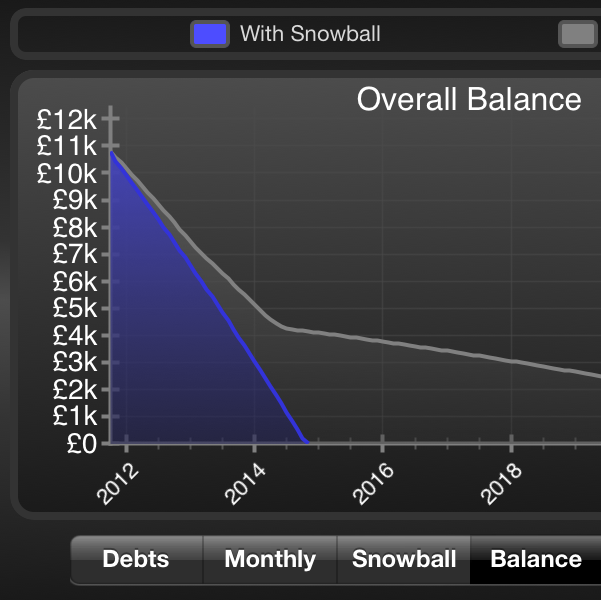 The 'Reports' (rotate the device sideways on the iPhone) let you visualise various statistics, such as the payoff timeline and the debt breakdown. You can even compare debts side by side. The iPad version of the app takes advantage of the bigger screen to make it even easier to use. Once you have entered the debt details, you can quickly switch between the debt summary, breakdown and chart using the buttons at the top. The 'Reports' have their own tab with beautiful full screen graphics. In you need to calculate a Min Payment or work out a Payoff Date, then switch to the 'Calculators' tab. Here you will find a set of calculators which will answer these questions, and more, in a jiffy. See below for a full list of the calculators provided. Debt Manager is designed to provide all the tools needed in order to help you pay off your debts. It was borne through the desire to help the many thousands of people who are struggling with debt and don't know what to do about it. 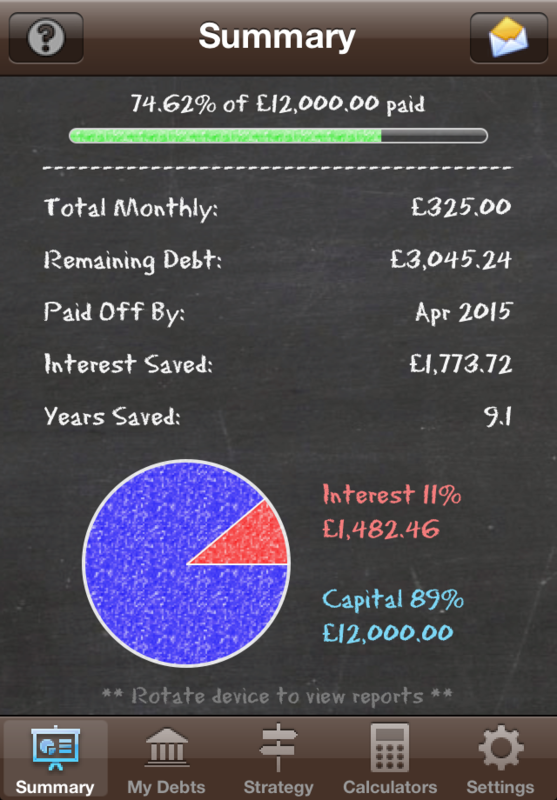 This app aims to show you the light and pave the way towards a debt free life!